All in all, there were 589 people attending clinic today. This does not include glasses. We NEVER have enough reading glasses for our clinics. Please consider picking up a few pair of inexpensive reading glasses and donating them to our next trip! I had a tremendous experience today. The lovely Nina took my place at registration and I went on a jiggers house visit with Johnstone! We walked quite a ways with the family’s children running from yard to yard yelling something about the Mzungu. I Asked if they were asking the other children to come see the white person. Johnstone was impressed I knew the language. Lol. I don’t, but I DO know children! 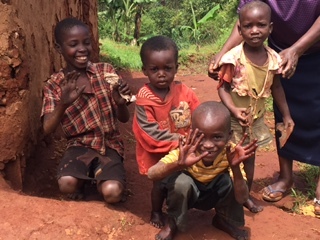 We had several children following along; skipping and chanting “Mzungu! Mzungu!” I felt like the pied piper. 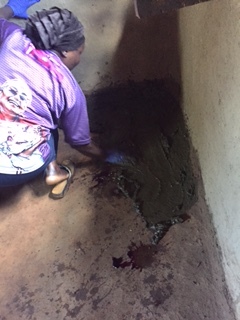 We carried everything out of the house and I watched Johnstone and his helper treat the floor by dusting and spraying with insecticide and then, essentially washing a bucket of cow manure in disinfectant and scraping a thin layer over the floor. There are some pictures to come. It dries hard. Like cement. It really does! It doesn’t sound rational, I know, and it certainly stank as it was applied, but entire houses are built with it and if you keep it maintained (as bits crack and fall off) it is an effective barrier against weather. I’m sure it must be seen to be understood! 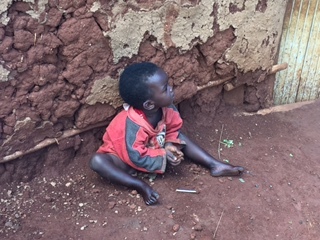 The difficult thing was the several children living in this home, and no mother. I was told she was in jail for alcohol or drugs. So the children live alone. The oldest is 15. I have to say this is my most difficult experience. To see her so tired, with a baby on her back, and now with more work to do, putting the house back together after the furniture and clothing and blankets sit outside in the sun for a bit after having been sanitized also. 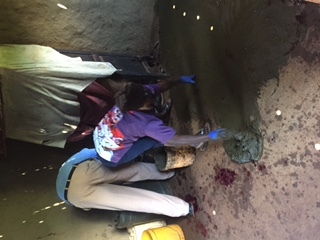 The next house was that of a young man who was treated for jiggers at clinic. He has brain damage from a combination of probably jiggers and malnutrition. He lives alone but was very helpful and appreciative. Afterward we treated 2 more houses and as well as the adults of each home as the children had already been treated at the clinic. Lynn is doing some more teaching at the schools this week. Michelle and Trish have treated some significant wounds. 13 today! I watched a infected finger be lanced and debrided. The poor woman! It looked extremely painful and she certainly flinched and squirmed, but allowed the work to be done in silent, keeping her hand still. The total cases of jigger treated at the clinic today was 27.